Some of Zion's greatest landmarks remain in constant view on the downhill trek: Angels Landing, the Organ, Great White Throne and in the distance, Cathedral Mountain. To the left is the huge Cable Mountain and the alcove of Weeping Rock. From the parking lot look up to the top of Cable Mountain for a perspective of the mesa the East Rim Trail descends from. Day Hike: Yes, but can also be done as a backpack. Distance: 10-miles one-way with the use of a shuttle. 20-mile round trip without a shuttle. Average Hiking Time: 6-hours from trailhead at the east entrance to the trailend at the Weeping Rock parking lot. Sun Exposure: Full Sun on most of the hike. Begin this hike early in the morning since the start of the hike is hot and sandy. Bring plenty of water! Permits: Not needed for day hike. If you plan to backpack, an overnight a permit is required. Trail Conditions: Maintained, dirt and rock path the first miles and paved the last miles. Trail gets muddy in the winter at times due to snow melting and may become impassible due to ice in winter. Trailhead: 150 yards west of the east entrance to Zion National Park. Trailend: Weeping Rock parking lot. Trail Access: April 1st to October 30th (usually): For a one way hike park a car at the trailhead near the east entrance of the park or use a commercial shuttle. At the end of the trail catch the Zion Canyon Shuttle at the parking lot back to the Zion Canyon Visitor Center, or Canyon Junction where you are parked. If hiking when the shuttles are not running then park the second car at the Weeping Rock parking lot in Zion Canyon. Off the Beaten Path: This is one of Zion's main backpacks and the end of the trail is shared with Observation Point and Hidden Canyon. Canyoneers also use parts of this trail to get to Echo Canyon. Classic Zion Hike: Yes. This is one of the main trails that the NPS advertises. Elevation Gain: 2148 feet with a moderate steady climb, but steep downhill descent the last 2 miles. Hazards: Long drop-offs along the last part of the trail, but the path is nice and wide for the most part. In the winter it may be icy and dangerous. Water Availability: Stave Springs is an unreliable water source and the water must be treated. During wet years there is a waterfall at Jolly Gulch some of the year. Restrooms: Restrooms are located at the trailhead near the east entrance fee booth but they are off the road and hard to see and at the trailend at the Weeping Rock/Observation Point parking lot. East Rim Trail - This 6 hour, 10-mile trail is spectacular. It is said to be "one of the most scenic in all of Zion National Park," and is on many lists as "one of the best hikes in Utah." With all the classic trail competition in Utah, like the Zion Narrows and Angels Landing, that is saying a great deal. This hike begins with a backdoor view of Checkerboard Mesa as it runs along intermittent Clear Creek and steadily, yet gently climbs through a juniper and pine forest. On top of the mesa the scenery gets interesting as a spectacular view of Echo Canyon takes center stage. Echo Canyon is one of Zion's well known slot canyons even though technical skills and canyoneering gear are usually required to explore most of it. On the East Rim Trail, however, you can get a peek of it. Throughout much of the rest of the hike, the trail drops into Zion Canyon, where Zion's landmarks steal the show. From the North: Travel I-15 south, past Beaver. exit on Hwy 20. Follow US-89 to Mount Carmel Junction. Take SR-9 to Zion's east entrance. From Arizona: Travel US-89A through Fredonia, Arizona and Kanab Utah. Follow US-89 to Mount Carmel Junction. Take SR-9 to the east park entrance. From the South: Travel I-15 north. Take exit 16 and travel through Hurricane to LaVerkin. Continue on SR-9 to the south entrance of the park. 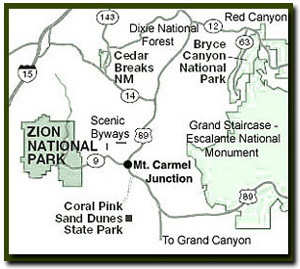 SR-9 through Zion National Park is always open and is also called the Zion-Mt. Carmel Highway. See restrictions for RV's. Zion Photo: The view of Big Bend when hiking down the steep last few miles of the East Rim Trail is breathtaking. East Rim Trailhead - The 10-mile hike starts at the east entrance of Zion National Park (park a vehicle here and another at the Weeping Rock parking lot or at Canyon Junction if the shuttles are running) in a wide open flat area. 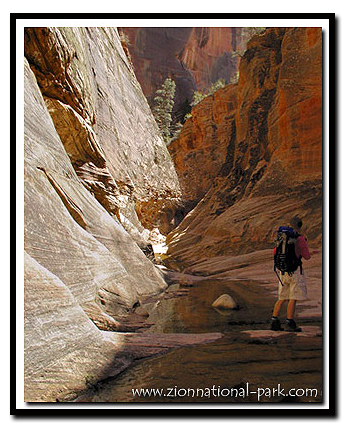 Watch for the small "trailhead" sign along the Zion-Mt. Carmel Hwy, immediately west of the east entrance booth. From the first section of the hike, the view looking back towards the road frames the geological wonder, Checkerboard Mesa. It's deeply etched crossbedding showcases the White Cliffs. The old wagon road trail (Winder Stock Trail) ascends gradually the next 5 miles through Junipers, Pinyon Pines, shrubs and some small Ponderosa Pines. Some places are sandy along the trail, but the steady climb to the top of the mesa is moderate trek. The (intermittent) creek bed of Clear Creek and the line where BLM land begins will be to the right. Jolly Gulch - Jolly Gulch is the first signed area the trail passes and is located 2.8-miles into the hike. It's a nice view down into a canyon, but when the water is flowing in Jolly Gulch the waterfall is magnificent. Layered rock is evident along much of this section of the trail. Stave Spring - Continue the uphill climb to Stave Spring. The spring is not much more than a pipe in the ground during years of drought, but during wet years there are streams flowing about Stave Spring. Look for the remnants (old posts) left over from the logging. This is the 5.7-mile mark . Another half mile and there is a sign directing the way to finish the East Rim Trail and giving the mileage for other options at the top of the mesa. The turnoff to Deertrap and Cable Mountain is just past Stave Spring (5.8 miles from the trailhead) and it is signed. Echo Canyon - With 4.3-miles left in the hike, the East Rim Trail begins to flatten. At the top of the mesa the scenery gets impressive as the trail edges the incredible Echo Canyon slot canyon. To the west the immense Cathedral Mountain looms. The view down into Echo Canyon is incredible, with the massive West Temple straight ahead. The slickrock of East Zion is abundant here, where patterns of ancient twisted and uplifted sand dunes steal the show. A gradual descent will now begin into what must be the most sensational section of Zion National Park. The trail is now a charming, rock lined, narrow path that winds around natures towering obstacles. 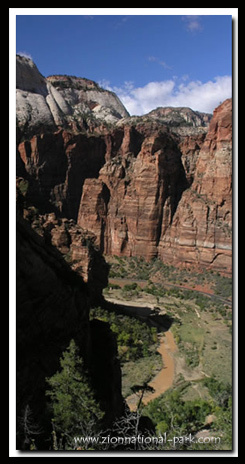 The East Rim Trail shows off the incomparable magnificence of Zion National Park's geology. Crossbedded sandstone cliffs reveal themselves. Little stacks of rock (cairns) are now all that mark the trail as it meanders over wind swept slickrock slabs. Fossilized sand dunes glitter in the sun. Giant monoliths are in every direction. Scenery does not get much better than this. East Rim and Observation Point now combine as the East Rim Trail joins with the lower portion of the Observation Point Trail. (elevation 5584 feet) Less than a half-mile is the entrance to Echo Canyon and the charming Echo Canyon Walkway. Echo Canyon Walkway and Entrance - The walkway allows for a nice close up view of Echo Canyon and leads to the entrance to Middle Echo Canyon. When conditions are dry this is a fun and easy slot canyon to explore. From the walkway, the trail descends steeply for 1.5-miles into Zion Canyon. To the right of the trail is another section of Echo Canyon where a visible water carved slot canyon winds below and during the winter and wet years there is water flowing. Trail History - The East Rim Trail follows a Paiute route, the John Winder Trail, to the top of a high mesa. Winder was a Mormon rancher with a goal to link Zion Canyon to the east. in 1923, Winder led surveyors to where the Zion-Mt. Carmel Tunnel was built. Big Bend - Farther down the trail, the panorama of Zion Canyon and Big Bend takes center stage. This panorama is one of the best views in the entire park. The Virgin River is forced around the Organ and the outline of the Angels Landing Trail is seen from its broad side. The Great White Throne and Cathedral Mountain loom in the background. The extremely steep path continues to switchback, while descending down past the spur to Hidden Canyon and finally to the Weeping Rock parking lot. East Mesa - Drive instead of hike to Observation Point. This East Zion Trail is a shortcut to this popular Zion View Point. Cable Mountain - 6-mile round trip, with incredible views of the Great White Throne, Angels Landing, Observation Point, and the West Rim of Zion. Deertrap Mountain - 8-mile round trip, with nice views of Mountain of the Sun, the Twin Brothers and the Court of the Patriarchs. 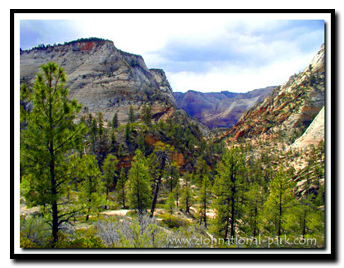 Hidden Canyon - This trail is located toward the end of the East Rim/Observation Point trail. From the canyon entrance its .5-miles to the 20 foot freestanding arch and then it is possible to continue about .6 more miles through the canyon. Observation Point - This trail is about 4-miles round trip from the Observation Point//East Rim junction. Marvelous views of Zion Canyon can be seen along much of this this hike as well as at the view point at the end of the trail. Echo Canyon - Going through the slot canyon usually involves getting wet and always requires climbing past obstacles. GPS coordinates are only references and may or may not be accurate. Do not rely on GPS coordinates as the sole method of navigation. Always have an accurate, detailed map at hand and have the proper map reading and navigation skills before setting out on any hike. Many of the hikes listed in this guide travel into canyons where a GPS has limited capabilities. Always check your position with a detailed map before dropping into a canyon. Beta: Coordinates and other trail and canyoneering information by Zion Park search and rescue veteran team member Bo Beck and www.zionnational-park.com author Tanya Milligan. Suggested Gear: A sturdy pair of shoes are recommend to hike the trails in Zion National Park. Many quality shoes will help grip the rocks and prevent injury. Stay in a hotel the heart of the parks, Mount Carmel Junction, and visit the treasures of the Southwest and Utah.